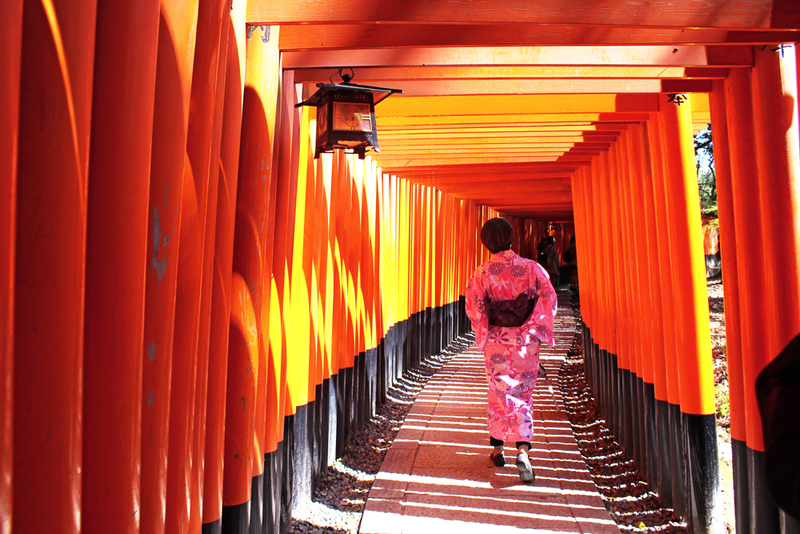 The ancient UNESCO World Heritage site of Fushimi Inari Taisha is a must-see for anyone visiting Kyoto. 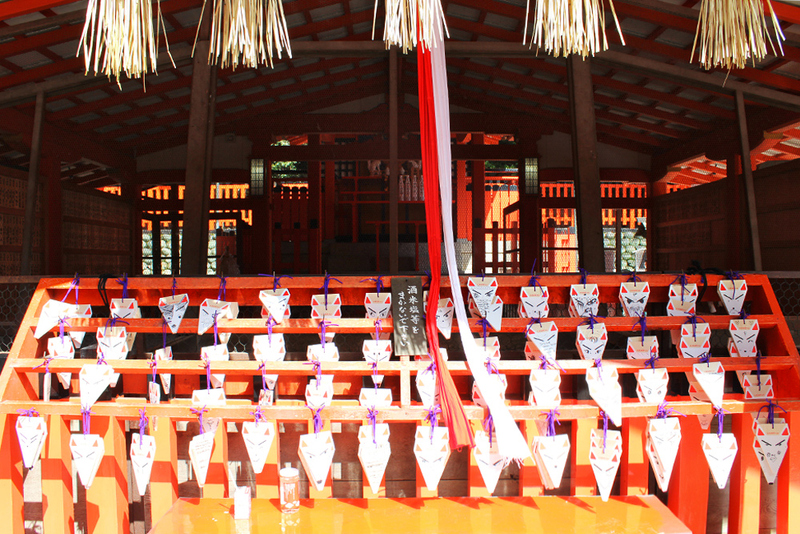 Established in 711 AD, it is the head shrine of all Inari Shrines that number as many as 32,000 in Japan. 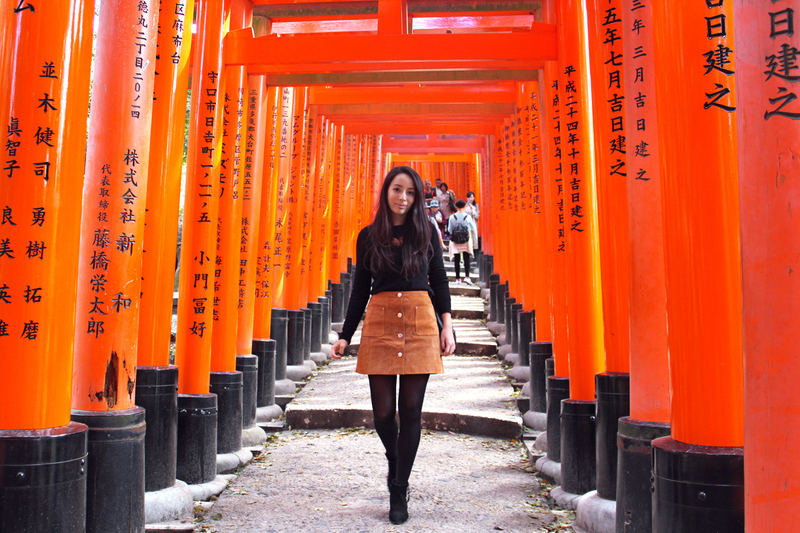 Fushimi Inari’s name comes from Fushimi-ku, the name of the area where the shrine is located, and Inari, the name of the mountain on which the shrine sits and of the Japanese Shinto god of agriculture, rice and business. As such, Fushimi Inari is often frequented by businessmen praying for success, and it’s incredibly crowded at certain times of year such as New Years. The main suggested path to explore Fushimi Inari Taisha and to climb the mountain is about a 3 hour walk, starting at the bottom, at the main entrance. This stunning mountain-shrine complex is famous for its thousands of vermillion colored gates – “torii” – that line the 4.2 km main path, creating a surreal, seemingly unending and almost tunnel-like walk to the mountain lookout. 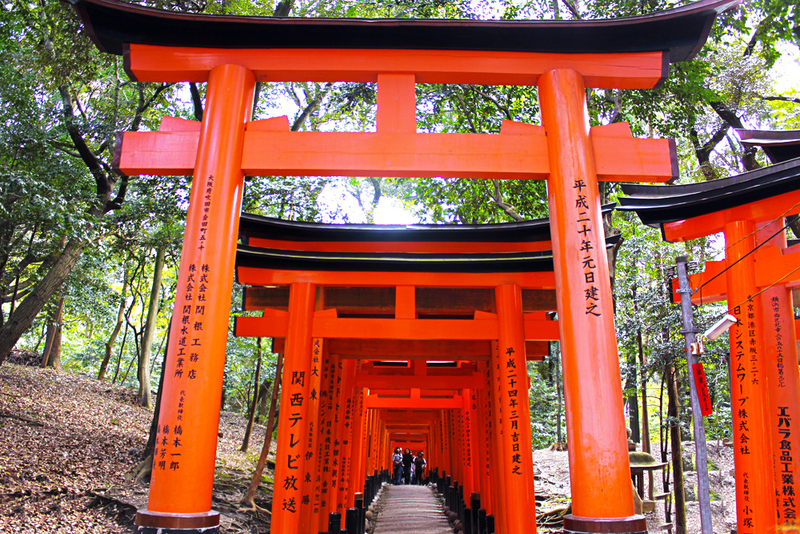 To give a little background, a Torii gate is an entrance to a sacred shrine in the Shinto religion. They mark the pathway to shrines across Asia, and I’m sure you’ve come to know them as a symbol of Japan. 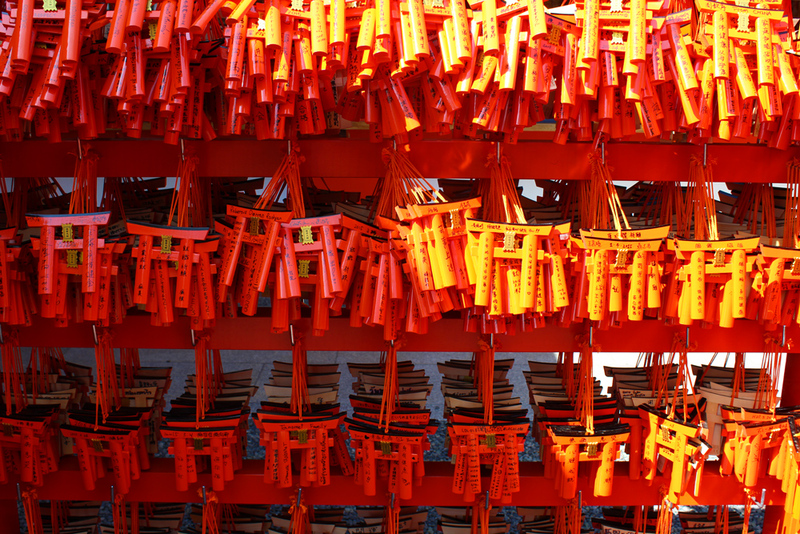 These torii are mainly sponsored by companies or businessmen. The inscriptions on the gates themselves show the business name on the left and the date their sponsorship started on the right. 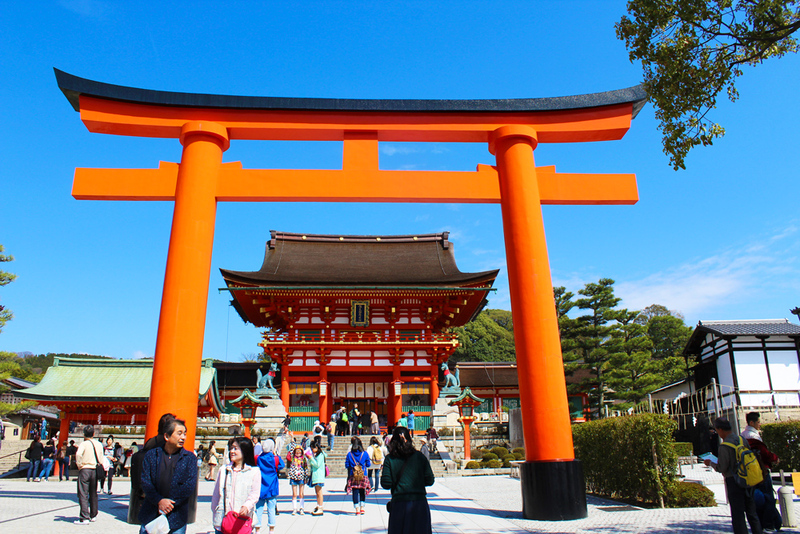 The largest gates cost 1.3million yen – about $15,000. If you wish to pray for happiness and success but don’t have thousands of dollars to pay for a large gate, you can buy a smaller ornamental sizedgate, and have your name painted on it. It will be placed in a smaller sub-shrine or grave on the mountain. You will also see many fox statues and souvenirs around the site, as foxes are believed to be the messengers of Shinto God Inari. You can even write your wishes and draw the fox’s face on a fox card ! In my opinion, the best way to experience Fushimi, is in quieter times – at dusk perhaps, when the tunnels of torii are lit up. 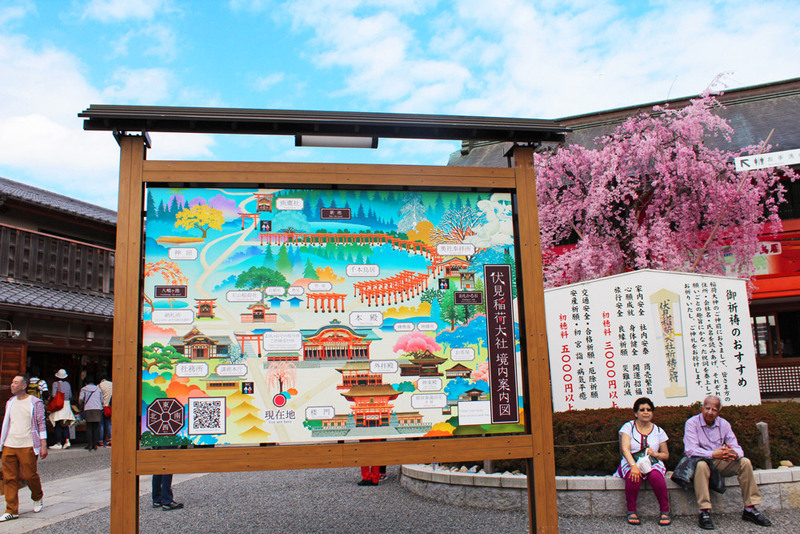 By the way, the entrance is free and the shrine grounds are open to the public around the clock. The easiest way to get to Fushimi Inari shrine is to take the train. Japan Railway Inari Station (about 5 min from Kyoto Station on the Nara line, 150 yen) is directly across the street from the Sakura-mon gate. The next closest station is Keihan Fushimi-Inari station.